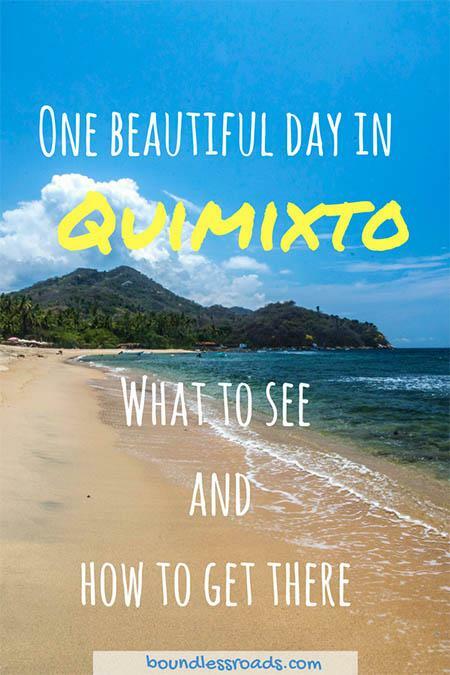 The beach of Quimixto is the first 1-day tour I did during my stay in Puerto Vallarta. 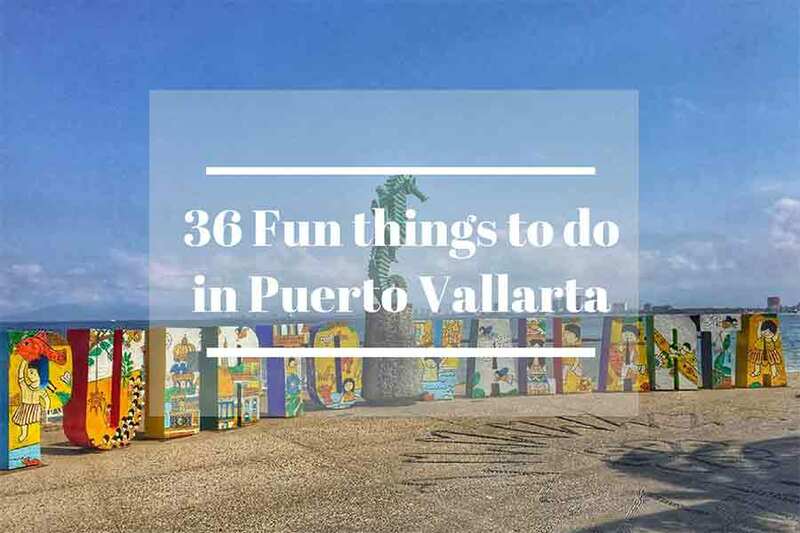 As I was mentioning in this article on things to do in Puerto Vallarta, I was in Vallarta for a month as a house and pet sitter. I am actually cuddling a kitten sweetly sleeping on my lap while writing this article. 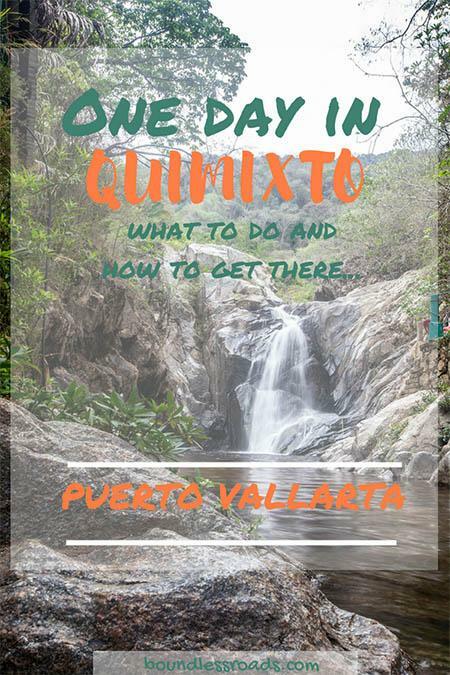 I have been on the laptop for the first 2 weeks with no breaks but as a friend came to visit me I have forced myself to take a break and venture out to discover the surrounding of Puerto Vallarta. Quimixto was one of the beaches I was suggested to go first, and off we went. 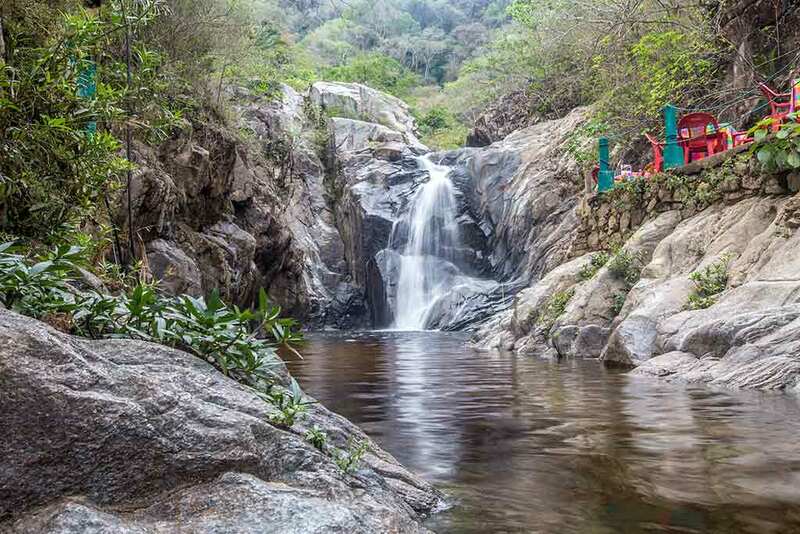 Situated within the municipality of Cabo Corrientes, in the State of Jalisco on the southern part of BandeBay bay. 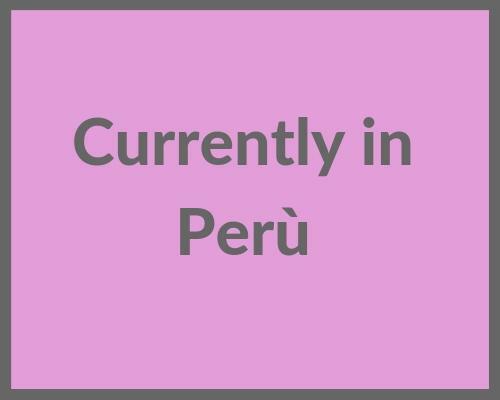 It ‘s a tiny fishing village with about 423 inhabitants only. 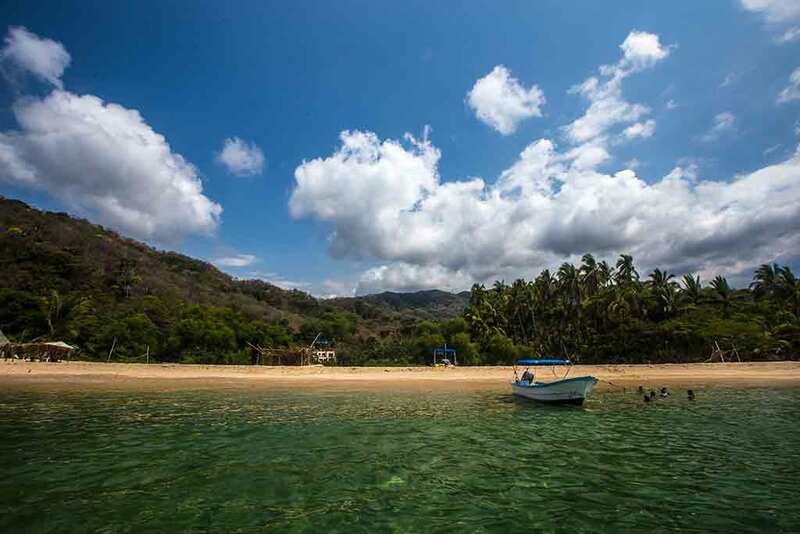 Quimixto is a very popular beach among locals and tourists, actually one of the most popular beaches of Banderas Bay. Our water taxi dropped us off at the pier from where we started to walk following the cobblestone road, actually the only one, which runs along the beach and eventually disappears in the jungle, after a few houses. That’s where we were going, to discover a small waterfall after a brief hike. We asked to make sure we were on the right path although it didn’t seem to have other options. 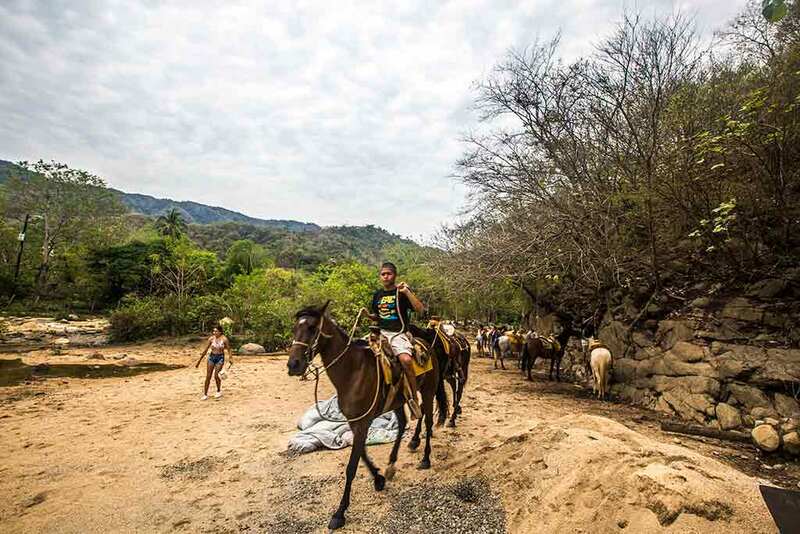 Just before leaving the village there is a horseback riding place where you can take a ride to the waterfalls for 150 pesos, in case you don’t feel like walking. We didn’t of course, as we prefer to leave those poor animals alone and use our own resources. The walk in the woods was very pleasant and really short. In about 20 minutes we were at the waterfall, not without bumping into other tourists coming back from their horse ride. The waterfall was beautiful to look at and very refreshing. The only aspect of that walk that bugged me in big proportion was that the restaurant is located on top of two hills from where you can have a closer look at the waterfall, but in order to do that, because you are passing the restaurant territory, you have to buy a drink, at least, which of course was extremely overpriced. 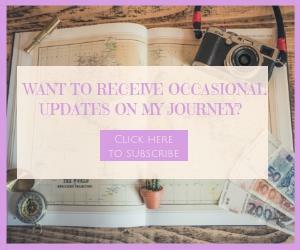 I didn’t like it and didn’t like the vibes there, so I prefer to take the lower road and enter the waterfall from below. The photo came out nice anyway. There was not a lot of people, yet and it was peaceful. After we took our shots and were refreshed we made our way back to the beach. We couldn’t wait to be in the water. We arrived on the beautiful beach and jumped in the emerald green water immediately. There was a lovely restaurant, the only one, which I was recommended, right on the beach, where we had our lunch after a nice swim and some sunbathing. There is a chance to rent beach chairs and umbrella but we were just fine as we wouldn’t have stayed too long. The restaurant offers a fish menu and if you are vegan there is only guacamole for you or you might ask some quesadilla with vegetables without queso (cheese). The day was beautiful and went by too quickly as our ride back arrived while we were just enjoying the water. Definitely to be repeated. 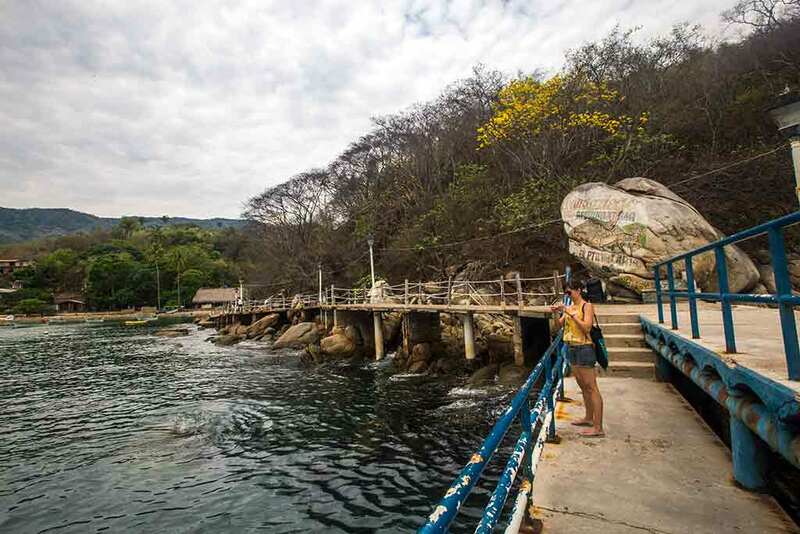 Quimixto is one of the villages and beaches located on the coast south of Puerto Vallarta, that you can reach only by boat or by hiking. 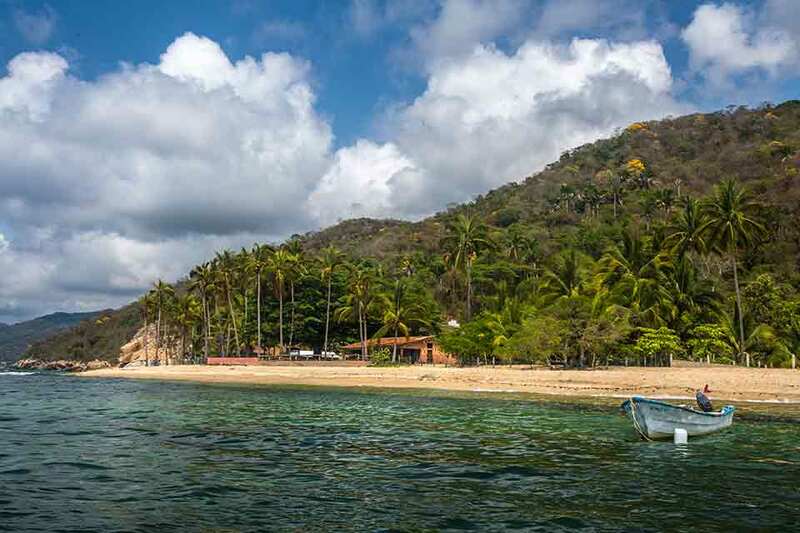 The most popular is Yelapa, which is the farthest and biggest of all. 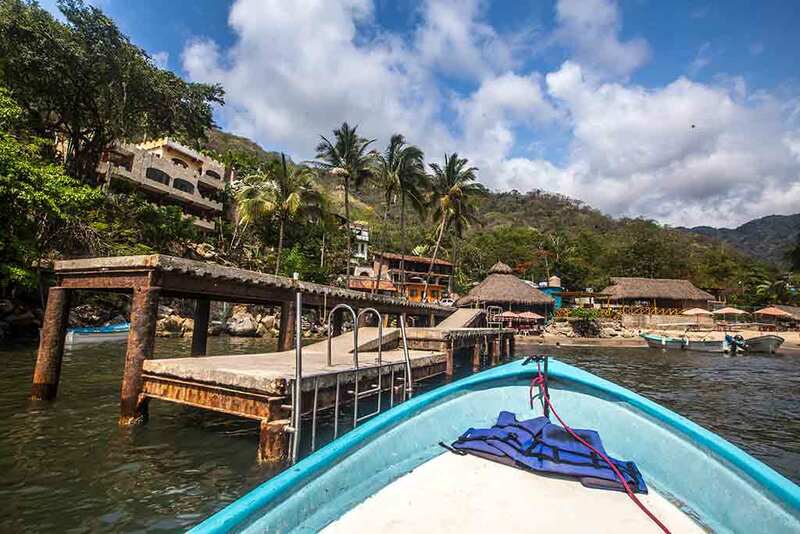 You can either get a water taxi from Puerto Vallarta but they only take you there, they won’t bring you back and you will need to find some ride from there. 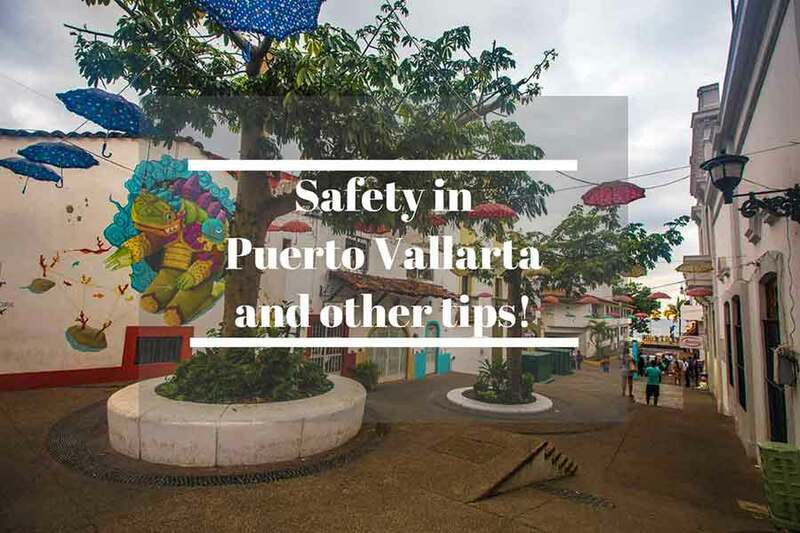 The easiest way is to hop on a bus (white and orange bus) from Calle Basilio with Constitucion in the Old Vallarta area and get to Boca de Tomatlan. It’s a very small fishing town. You cannot get lost and everything is at an easy distance. 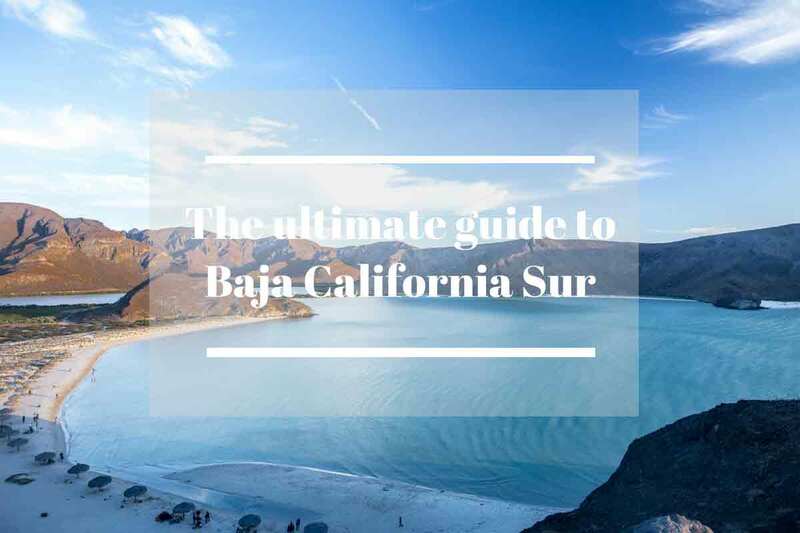 Once you get there you will go to the pier and ask for a ride to Quimixto. Water taxis will run periodically so there is no fixed schedule. 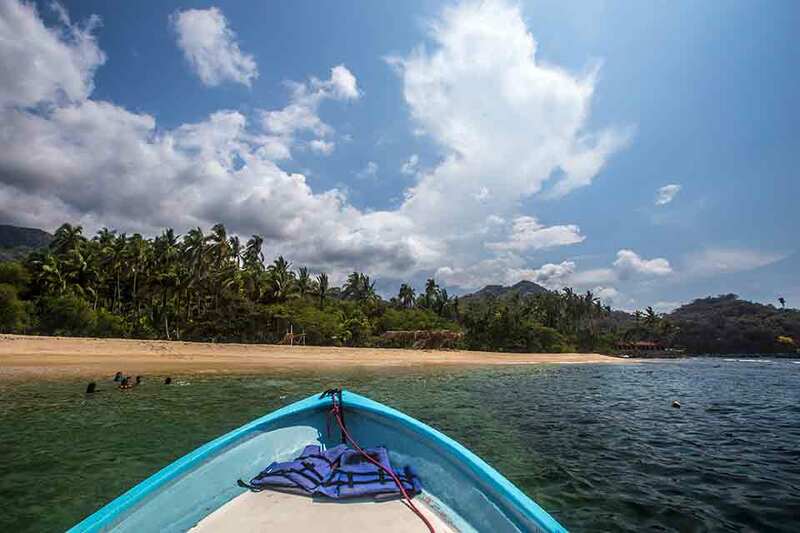 You will need to tell the boat capitan at what time you want to get picked up on the beach to get back to Boca de Tomatlan. The boat ride is a pleasant 20 minutes fast ride along the coast, where you can see lovely hotels and other beaches. 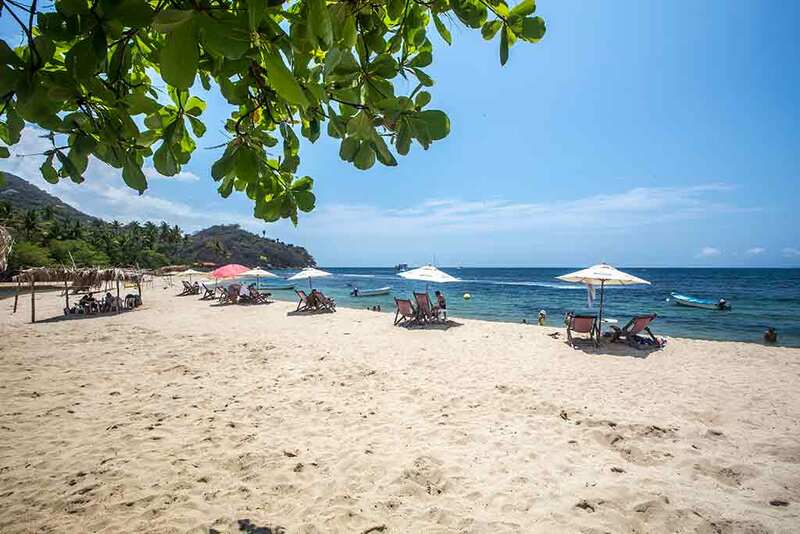 You will pass by Colomitos beach, a beautiful tiny beach on a private bay and Las Animas, which is one of the most popular but too crowded for me. You will also see lovely hotels and cabañas scattered around the hills. It would be nice to spend a couple of nights there. gym shoes or hiking boots. You could easily do it in flip flops but it wouldn’t be comfortable. Besides, it’s better to protect yourself from mosquitos and other bugs.